Health care prices in Minnesota vary widely and lack transparency, and that opacity contributes to an inefficient and inequitable statewide market. 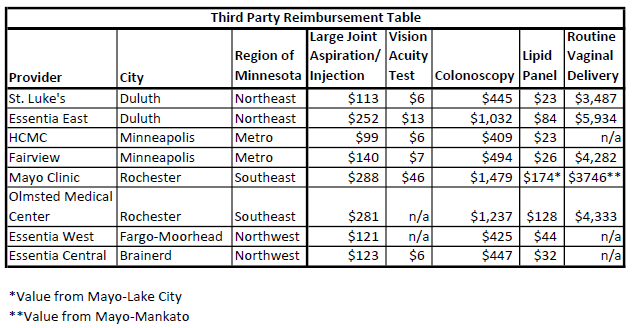 Minnesotans often pay significantly more for the same procedure depending on where they live, without a simple way to evaluate procedure prices. Stronger efforts at transparency—in both the actual costs borne by patients, and in the negotiation process between health care systems and third-party payers—would give Minnesotans better choices. Pricing transparency might also force medical groups to accept lower, more competitive reimbursements for outlier services. Last week the Minnesota Department of Health (MDH) published a report that details the ranges in costs for several expensive, common procedures. While some hailed the report as a victory for cost transparency, a non-profit, Minnesota Cost Measurement (MNCM), has published a health care cost-transparency tool since 2014. The most recent iteration, the 2017 Cost and Utilization Report, examines the costs for over 100 procedures performed in Minnesota’s hospitals and health centers. In the table below are some examples of the differences observed in how hospitals are reimbursed for services. This report provides a wonderful resource for those curious about what insurance companies pay to health care providers, but omits an important aspect of health care costs—the negotiation of reimbursements for medical procedures. The negotiation process for reimbursements usually follows a certain pattern, and favors those with bargaining power. (For more information on this process, see this article and this podcast.) The hospital or clinic names a price for a service, and third parties propose a discounted rate to the providers. Negotiations continue until both sides agree to prices, after which the insurance companies announce to their members that the health plans will cover any services rendered at said hospital. When covered patients use the hospital, the hospital bills the insurance companies at an over-inflated price, the insurance company covers at a lower, agreed upon rate, and the hospital waives the rest of the bill. The federal government uses a formula to determine reimbursements for enrollees of public programs instead of repeating this process for every hospital and health center in America. Armed with Medicare patients by the millions, the federal government has significantly more bargaining power than third-party payers. People without insurance—or even patients merely out of network—have none of this bargaining power. Hospitals charge these unfortunate patients the prices listed in the chargemaster, which is a list of those over-inflated prices, and is otherwise a negotiating tool. Since 2011, the Centers for Medicare and Medicaid Services (CMS) has released reports including submitted charges with the same purpose of transparency as MNCM. CMS reports on every hospital and health center in the country, as they all take some patients on Medicare and Medicaid. The report lists the average price charged by the hospital for group of procedures, the number of Medicare admissions by the hospital, and the amount CMS reimbursed the hospitals for services rendered. The spreadsheet below includes the charge data for 35 Minnesota hospitals on a variety of services. Comparably low charges are shaded in green, more expensive charges in red, with lower-volume procedures in gray. This chart implies how hospitals value certain services, as well as implications on where hospitals begin their negotiations with third-party payers. The spreadsheet is available as a PDF and as a link to Scribd. Hospitals charge widely variable prices for health care by geography, though prices also fluctuate considerably within comparable regions. For instance, the Metro area has among the highest charges for pulmonary tests in the state, but Park Nicollet Methodist Hospital in St. Louis Park charges less than the state median. These inconsistencies allude to the tenuous correlation chargemasters have with geographical differences in costs. The hospitals generally know what care should cost, but some hospitals drastically undercharge or overcharge—likely because negotiations are proprietary. MRI charges and cardiac imaging charges exhibit more drastic variance in costs, with a $3,314 gulf between the poles of MRI charges, and a $5,033 difference in range for cardiac images. If the equipment used for MRIs and cardiac imaging is approximately the same for all hospitals, explanations for what might cause this variance are unclear. Individual hospitals rarely have universally high or low charges for all services. One procedure might be relatively inexpensive, while another at the same hospital might be priced far above the state median. If a local hospital values MRIs more than the rest of the state, then efforts at transparency might lead to more accountability and consistency. The discrepancies between the CMS-reported hospital charges and the average commercial reimbursements reported by MNCM are quite large in many instances. Minnesotans deserve accountability for an accessible, comprehensive data source for hospital charges and third-party reimbursements, as these figures have real and possibly drastic consequences for patients. Approximately 94% of Minnesotans will never encounter a chargemaster price. Those Minnesotans have insurance. Nevertheless, opaque chargemaster prices and equally opaque negotiations harm all of us here in the North Star State, the uninsured most of all. Chargemasters have, at best, a tenuous association with actual costs of care. Minnesotans deserve an explanation for the massive variance in chargemaster prices, particularly when hospitals charge uninsured people at those prices. Bills based on the chargemaster—a document used as a negotiating tool—are capable of bankrupting people. The burden carried by that 6% of patients that pay well beyond the market price is an unconscionable one. The MDH report was a promising first step by policymakers to begin the process of completely transparent medical billing. Its report exposed a sizable problem in need of a solution that protects patients. Transparency in health care prices is most useful when applied to individual hospitals and clinics. Lawmakers should mandate the creation of a complete and user-friendly platform for consumers interested in what their premiums and hospital bills pay for. Accountability and transparency are first steps towards a health care market that works for all Minnesotans.